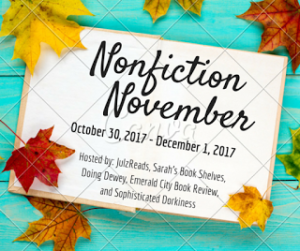 For this week’s Nonfiction November topic we go to Sarah from Sarah’s Bookshelves who has put together the following prompt: Pick two books that go together. I struggled a bit with this one until I remembered what is one thing I love to do other than reading? Journaling (making journals and keeping my own). So then it became a bit easier to choose two books which I think you’d enjoy if diaries are something that appeals to you. For fiction a very fun read is Bridget Jones’s Diary by Helen Fielding. I read this when I myself was a singleton and I loved every bit of it. It was often hilarious and had me agreeing with Bridget on the trials of finding a good job, the right guy and crazy friends/family. I love the movie version too and have lost track of how many times I’ve watched it. It’s usually my go to whenever I’ve been sick. Now if you think anyone can keep a journal, you are right. A lot of us have had those little journals with locks right? But I think what makes people lose interest in journaling so often is the idea that you have to always do the same type of entries or that it has to be linear. Break all the rules. Journaling can be whatever you want it to be. You can use pictures, you can use scraps of junk mail, you can actually not even write at all. I think you get the idea right? I’ve read a ton of books on the art of journaling and now I keep about 5-6 journals myself but if you are new to keeping a diary and/or what to pick up where you left off check out Note to Self by Samara O’Shea. I read this book a few years ago and still recommend it to anyone who is thinking of picking up a diary practice again. The chapters in this book are divided on topics such as writing about everyday life, finding your spiritual path, dream journaling, blogging and even detailing the intimate life. She’ll show you what the benefits are when writing on any of those topics and guide you on how to approach writing about them as well. I hope this gives you an idea of two books to check out. Would love to hear if you’ve read these or if there are some others that you think would make perfect pairs. 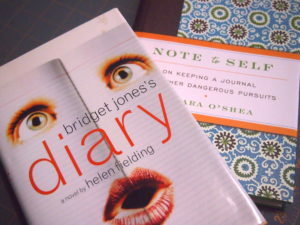 I haven’t read either book, although I saw Bridget Jones’s Diary, and I have read books about journaling. Note to Self sounds like a good companion to Bridget Jones. I’ve kept journals since I was in college, but they are all exceedingly dull because I edit my thoughts. I love reading fiction with a journaling format and I have enjoyed journals by May Sarton, Doris Grumbacher, and others. What a great idea to pair a fictional journal and a nonfiction book that guides with topics and how to write about them in an interesting way! Note To Self sounds like it is worth reading. I’m going to look for it! I’ve only read Bridget Jones twice, but I loved it. And the sequel (although the first one still claimed the bulk of my heart). Although I know the more recent one in the series got mixed reviews, I’d still like to read it. I’ve also made note of the Samara O’Shea journalling book. I have found my relationship to my diary has changed a lot in the past ten years and I’m always interested in trying something new there! Can you believe that I still haven’t read Bridget Jones’s Diary? Note to Self sounds interesting so will have to check it out. What an excellent pairing! I have to admit that even though I need no help for keeping a diary, I have a soft spot in my heart for books on how to do it. I will have to look up Note to Self! Notes to Self sounds wonderful… and I love the cover. Great pairing! Jenclair – Bridget Jones is such a favorite character of mine. Both the film and book version! I have read one May Sarton book which I loved but haven’t read anything by Doris Grumbacher. You’ve got me curious now! Kim@Time2read – I hope you’ll enjoy it! Buried In Print – I did read the sequel and it was fine but I feel like it was one of those books I didn’t need a sequel for. My “diary” relationship has also changed tons over the last years so it’s always interesting for me to hear about how others journal, etc. Melody – Oh you have got to check it out! It is so funny. Stefanie – I totally know what you mean. I just love to hear about what others do for diary keeping and it’s just so interesting. Joann@Lakeside Musing – It’s so pretty isn’t it? Sort of reminds me of a vintage book cover. Great pairing! I loved Bridget Jones’s Diary when I first read it, and I still think back on the format. The nonfiction book about journaling sounds intriguing.